In Deuteronomy 6:4-9, parents are called to impress the commandments of God upon their children at all times and in all places. While believers have traditionally made use of family worship and devotions to accomplish this task, the neglect of this time-honored practice can make it hard for desirous fathers and mothers to know how to raise children in the fear and admonition of the Lord. 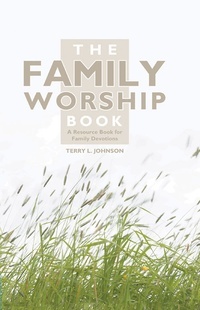 In this book, Terry L. Johnson provides a helpful resource for family devotions. Rev. Johnson gives instructions for assisting parents develop worship in the home, explains why family worship is important, analyzes the weekly cycle of devotions, and provides resources for Scripture reading and memorization as well as an order for worship that includes singing, prayers, and creedal recitations.